Auto body shop equipment investment is a critical expense that generates short-term ROI. This world is always going to be filled with cars and those cars will always require a collision repair service once in a while. Doing an auto paint job for collision repair purposes at the service facility is a matter of pride for dealerships and auto body shops. There are many upmarket shops out there, which do not offer this service, even though they have a well-equipped facility. Some shops might even have the capability to create custom cars but a paint booth is absent in the shop. All the mechanical related work is done in house and the whole painting process is outsourced. In this case, sometimes the customer has to bear the painting cost. This proves to be a matter of dissatisfaction for the customer as a whole. Your auto body shop equipment is a long lasting asset – Invest in it! Painting larger surface areas is a much more difficult job than it looks. As vehicle size increases it gets difficult to eliminate the tiny dust and dirt particles from the painting room. Since paint jobs are divided into different processes, it is much easier to manage this complex task in a designated paint spray booth rather than an unorthodox self-made garage. Spray booths are cleaner, environmentally friendly and provide great finishing results. The new body shop trend is definitely shifting towards computer controlled paint spray booths because of its functionality, easiness and comfort. Since some of the paints used in spray booths are flammable liquids, it is required to approve the booth to nationally recognized testing laboratory (NRTL) regulations. The complete purchasing procedure and installation of the booth is overlooked by NRTL to assure a safe painting process. 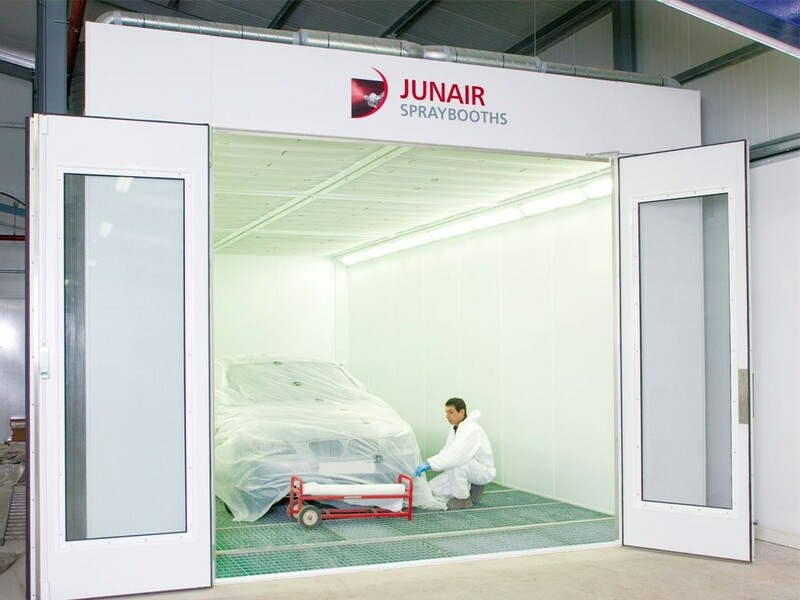 Spray Tech / Junair’s spray booths are NTRL permitted for more than 15 years and provide the highest level of manufacturing excellence to the our customers.